Roll Technology specializes in custom hard chromium plating and finishing of web-based industrial rolls, offering a complete range of surface finishes. One of the most popular finishes is the Matte surface finish — used mostly on heat transfer rolls to impart a surface finish for a non-gloss appearance. What do matte finishes look like? They have a dull, gray surface which is generated by controlled grit blasting into a hard chromium plated deposit. The resulting peaks and valleys formed from this procedure allow air between the roll and the product which aids in the release of the web from the roll surface. Should sticking still occur, it would then be wise to investigate the heat transfer performance of the roll itself. 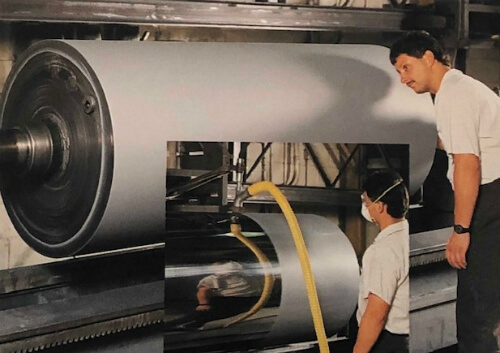 With over 40 years of roll plating, precision grinding, and finishing history, Roll Technology is your trusted source for precision roll finishes. Contact us today with any questions or applications you may have!